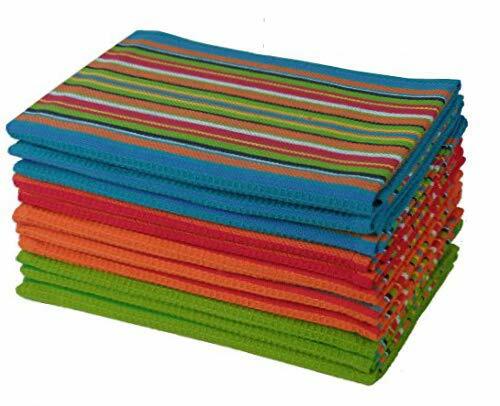 These 12 Pack 100% Cotton Salsa Stripe Multi-Color Kitchen towels are a great value and highly versatile. Their utility extends beyond the kitchen into practically every room in the house. VALUE PACK: Each set contains three each of Tomato Red, Lime, Orange and Teal. Size: 16x28. HIGHLY ABSORBENT: The 100% Cotton handwoven textured construction makes these towels extremely absorbent. STYLISH & FUNCTIONAL: These kitchen towels are a set of brilliant Salsa colors. They are as functional as they are stylish. Each towel features a convenient hanging loop. Recommended to wash before use. The absorbency will increase with each wash.